Liturgical Objects in Museums: Analogous to Musical Instruments? The Metropolitan Museum has published its program of Concerts and Lectures for the 2011-2012 season. One in particular caught my eye, because it seems linked to a topic discussed here a couple of days ago: the place in museums of religious ritual objects and how it isolates them from their proper context. In 1920 Dwight Partello died, leaving his important collection of violins to the Smithsonian Institution and sparking a national controversy about whether fine instruments should be kept in museums or used by performers. The Partello collection did not go to the Smithsonian, but, soon after, two Stradivari violins did enter the Met. This lecture examines the context of violin collecting and the ongoing tension between preservation and performance. These are certainly at least partly analogous issues. Instruments are used to enact music in much the way liturgical objects are used to enact liturgy. As executors of his estate, Partello had named George W. White, President of the National Metropolitan Bank, and his “life long family friend,” Flora B. Thompson, with whom Partello had been very close in his last years. Partello’s daughters didn’t trust Thompson and charged that she had unduly influenced Dwight to leave his valuables to the Smithsonian instead of to his children. Carita was still in Germany, so it was left to Adeline and her husband, Arthur Abell, to contest the will. Since her father’s testament seemed to be in order, Adeline and her husband decided that their best chance of recovering Partello’s violin collection was to convince the Smithsonian to denounce the gift as not in the public good. To this end, they rallied the musical community to their defense. Arthur Abell, who had been a music critic for more than 20 years and was therefore acquainted with all the great international musicians, was particularly effective in this part of the strategy. Word was spread through the music grapevine that Partello’s collection of 25 important instruments were about to be lost to musicians forever and that the best chance of preventing this calamity was to write letters in opposition. The controversy was played out in public following an editorial by the NY Times columnist Richard Aldrich on Feb. 27, 1921, in which he stated that “the collection of fine violins is an injurious pastime” and that “the assemblage of fine violins for any other purpose than having them used for the purpose for which they were intended is an injury to the whole musical world.” Without mentioning Partello by name, Aldrich made it clear that he was deeply offended by the idea of leaving the instruments to the National Museum. You can read Aldrich's full column on the New York Times web site. Thanks also to Eve Tushnet, who linked to my previous post on this topic. Her reflection "Mary, in the Glass Coffin of the Museum" is definitely worth reading. Photograph by Wikipedia user "Husky" of a Stradivarius violin. Used under a Creative Commons Attribution 2.5 Generic license. When Baronius brought out a book on Freemasonry a while back, we joked that you're not really a traditionalist publishing house until you have a book on your list about the evils of Freemasonry. This despite Masonic plots not being high on the list of things most people, even traditionalists, worry about these days. Another question is membership of a Masonic lodge. In spite of what you might hear from time to time, Catholics are not permitted to be Freemasons. Men seeking to enter the Ordinariate will need to resign from the lodge. This raises the spiritual challenge, whether commitment to Jesus Christ our Lord and Saviour and membership of his Church takes priority in your life. Don't be mislead, the Catholic Church hadn't ever relaxed its stance on Masonry (as Cardinal Ratzinger reiterated in 1983), but it's not something you've heard prelates talking about since at least Bishop Bruskewitz's excommunication of Freemasons (along with SSPX members, Call to Action members, and Planned Parenthood supporters among other groups) in 1996 (confirmed in 2006). There's actually been a blowup over freemasonry in the Church of England as a result of the ordinariates. It turns out that the man appointed as the new Anglican Bishop of Ebbsfleet (the previous holder of the office, the now Msgr. Andrew Burnham, resigned to become a Roman Catholic), the Rev. Jonathan Baker, was a Freemason and indeed a national chaplain for the organization in England. It didn't stop his appointment, though the Archbishop of Canterbury apparently asked him to consider resigning his membership, which the Bishop-elect has now done. Back in 2003, Rowan Williams apologized to Freemasons after making harshly critical comments about "The Craft". Before the seventeenth century, few rural French laymen knew basic prayers, let alone many tenets of the Christian faith, but by 1800 almost every child in France had access to some form of religious education. Boys as well as girls were expected to recite the entire catechism as a condition for first communion—and the could. ... By 1800, though ... Bishops took personal responsibility for educating the young laity, selecting a catechism and distributing it in increasing numbers. During the bishops' visitations, the curés were required to produce children who could recite that catechism perfectly. This history lesson was particularly interesting to me, because I have just started reading John S. Kennedy's Light on the Mountain: The Story of LaSalette. 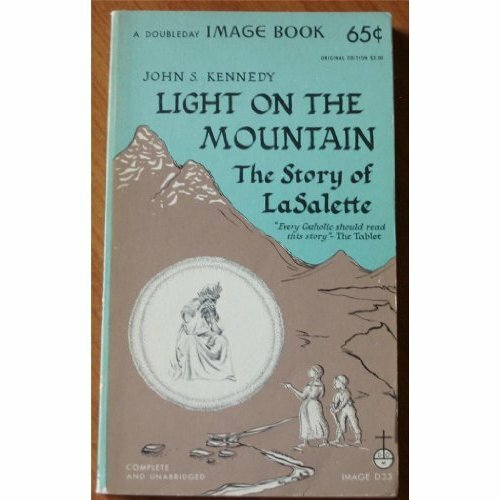 On 19 September, 1846, about three o'clock in the afternoon in full sunlight, on a mountain about 5918 feet high and about three miles distant from the village of La Salette-Fallavaux, it is related that two children, a shepherdess of fifteen named Mélanie Calvat, called Mathieu, and a shepherd-boy of eleven named Maximin Giraud, both of them very ignorant, beheld in a resplendent light a "beautiful lady" clad in a strange costume. Speaking alternately in French and in patois, she charged them with a message which they were "to deliver to all her people". After complaining of the impiety of Christians, and threatening them with dreadful chastisements in case they should persevere in evil, she promised them the Divine mercy if they would amend. The story of the rise of religious education in France is useful background for understanding Kennedy's emphasis on the seers' religious backgrounds. What prayers did Melanie, who had had not a day's schooling, know? The "Our Father" and the "Hail Mary" in patois, for she ahd just scraps of French. These prayers her mother had taught her, that perpetually worried woman who distractedly wondered what would ever become of her scrawny little ones. A few bits of the catechism, too, Mme. Mathieu had drilled into her daughter at long intervals. But they were no more than odd bits, which Melanie could repeat only laboriously and understood hardly at all. She had been to church but a few times in her life. Wasn't there the begging to be done, or the duty demanded by closefisted employers who considered Sunday simply another day of work? Fourteen years old, almost fifteen and she had not yet made her first Communion. How could she have? That had to be prepared for, at length in catechism classes conducted by the curé of Corps, M. Mélin, and he had not so much as set eyes on this professional herder, generally so far from home. Sandro Magister's recent column "Only Beauty Will Save Us" excerpts from art historian and "immortel" Jean Clair's speech to the "Court of the Gentiles" in Paris in March. How many of the works in the state museums concern Catholic iconography? 60 percent? 70 percent? From the crucifixions to the depositions in the tomb, from the circumcisions to the martyrs, from the nativities to the Saint Francis of Assisis . . . Unlike the Orthodox who kneel and pray before icons, even when they are still found in museums, it is rare, in the grand gallery of the Louvre, to see a believer stop and pray in front of a Christ on the cross or in front of a Madonna. Should we regret this? Sometimes I think so. Should the Church ask for the restitution of its assets? I tend to think this also. But the Church no longer has any power, unlike the Vanuatu or the Haida Indians of British Colombia, who have obtained the restitution of the instruments of their faith, masks and totems . . . Should the Church be ashamed of having been at the origin of the most prodigious visual treasures that have ever existed? Being unable to have them back, could it not at least become aware of the duty not to leave them without explanation in front of millions of museum visitors? I think about this every time I go to the Met. Could not, for some objects at least, some accommodation be made. Could relics be venerated liturgically? Could chalices be used, say, once every ten years without seriously endangering them. Could we sing a Missa Cantata (because they probably wouldn't let us use incense and thus a Solemn Mass is out) on a portable altar in the Fuentiduena Chapel at the Cloisters. Etc. Monday was the 67th anniversary of the Allied landings in Normandy, "D-Day". National Review Online reminded us that it is also, therefore, the 27th anniversary of the speech Ronald Reagan gave on the 40th anniversary of the landings, "The Boys of Pointe du Hoc". What inspired all the men of the armies that met here? We look at you, and somehow we know the answer. It was faith and belief; it was loyalty and love. Can you imagine President Obama giving that speech? Or even President Bush? How about presidential candidate Tim Pawlenty? The question always arises though, was this sincere religious belief—civil and personal religion, if not institutional religion— or was this acting? I remember Ronald Reagan as president, but just barely. Being born in 1981, my earliest strongly political memories are of the 1988 presidential election. But working after college as a research assistant on a biography of Reagan Attorney General Ed Meese, I got to know the man, to the extent one can from reading books, as I got to read all the major biographies, many of the memoirs written by administration figures, and some other books like the excellent and important Reagan in His Own Hand. My verdict from that study was that this is not just great speechwriting (by Peggy Noonan), but that these religious sentiments were parts of Reagan's true self. This is just a link, but I liked it. Rick Connor's got a great site on fountain pens, including this guide to their construction. UPDATE: Hah! I already linked to this page back in 2008.